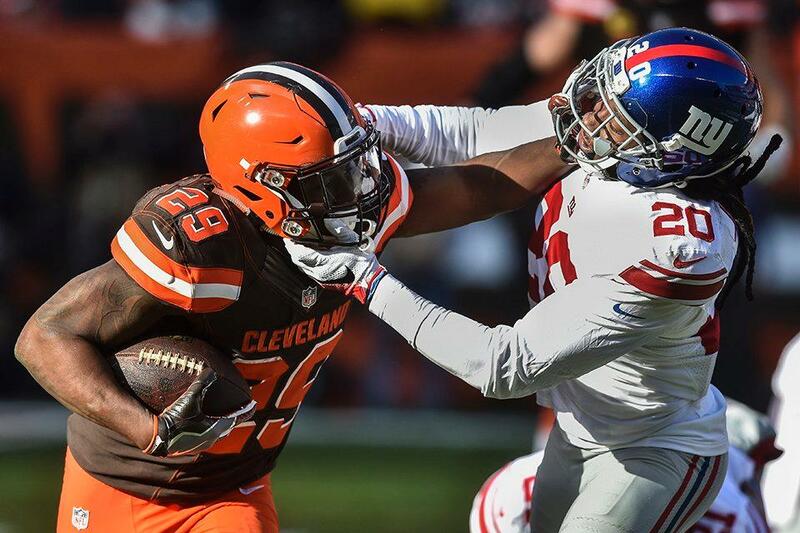 The Cleveland Browns continue to make history, just not in the way you hoped as they fall to 0-12 after the 27-13 loss to the New York Giants. It didn’t go well for the Browns on the opening kick as kicker Cody Parkey kicked the ball out of bound to give the Giants the ball at their own 40-yard line. Even with the favorable field position, the Giants couldn’t get the first down as the Browns held them to a three and out with good defensive plays by corner Briean Boddy-Calhoun. Josh McCown and the Browns offense took the field and couldn’t put together a consistent drive as they were off the field as quickly as they were on. The defense for the Browns played well early. with Boddy-Calhoun making plays at the line of scrimmage and the Joe Haden match up with the always dangerous Odell Beckham Jr, the Giants weren’t getting much done offensively. The Giants would back the Browns inside their own 5-yard line and they would punt out of their end zone to give the Giants the ball on the 50-yard line. Once again, with very good field position, the Giants would go three and out thanks to a couple of penalties and improved defense from the young Browns team. Beckham Jr was evaluated early in the second quarter and was shown to have a thumb injury but remained in the game. RB Isaiah Crowell ran to the left side of a pile and the ball slipped out of his hands and was recovered by the Giants. This would set up a touchdown pass from Eli Manning to WR Dwayne Harris to score the fist points of the game and lead 7-0 in the middle of the second quarter. The Giants would fumble the ball on a punt and the Browns would recover and have a chance to tie the game up with positive field position but would only settle for a field goal. With under two minutes left, the Giants would try to increase the lead. After a 37-yard catch by Victor Cruz, Beckham Jr would score on a 32-yard catch and run to go up 14-3. WR Terrelle Pryor would draw a pass interference call that would bring the Browns inside Giants territory with 55 seconds left in the game to chip into that Giants lead. The Browns were inside the 10-yard line with nine seconds left but, once again, couldn’t convert and had to settle for a field goal to end the half trailing 14-6. The rushing attack for both teams during this game were nothing to brag about. Both Crowell and Giants RB Rashad Jennings were under 50-yards rushing heading into the fourth quarter. Crowell was averaging 2.8 ypc while Jennings was averaging 3.8 ypc. For the most part, both defenses were impressive at taking away each offenses strengths. McCown had a hard time getting the ball to Pryor and his favorite target from last year TE Gary Barnidge while Manning only hit Cruz and Beckham Jr. a handful of times as well. While Manning has been known to play down to his competition, McCown was throwing balls into the ground and in front or behind his receivers. Still not out of the game yet, the Browns started on their own 5-yard line only down by eight. McCown would hit Pryor for a 54-yard gain but would have the ball knocked out of his hand into the arms of DE Jason Pierre-Paul and ran the ball in untouched for the touchdown to increase the lead to 20-6. McCown would however find the rookie WR Corey Coleman for the touchdown to make it a one score game at 20-13. Beckham Jr would show how great he is though after he scored his second touchdown of the day the very next possession to make it a two possession game yet again and would be the final score of the game at 27-13.